When Alexander Michael Bautista was a freshman at the University of the Philippines Diliman last school year, his challenge was not just adjusting to tough college classes and requirements. Attending classes in different buildings on the 493-hectare campus also presented difficulties to Bautista, a person with disability (PWD). 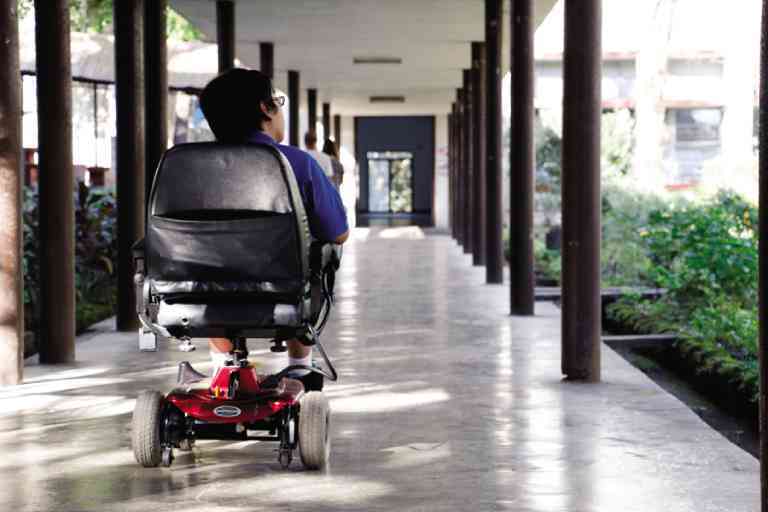 A student with spinal muscular atrophy, Bautista uses a wheelchair to move around. Most buildings at UP Diliman have classrooms on upper floors, yet no elevators or ramps to access them. To get to his classes, Bautista was carried up and down the three to four flights of stairs in his wheelchair by his father, his mother and often two or three staff members or security guards—whoever was nearby. Without a designated office in the university that can assist students with special needs like him, sometimes getting assigned to more accessible rooms can become complicated and challenging. As classes opened at UP Diliman in August, students with disabilities like Bautista faced these issues that stemmed not only from the lack of an office to address their needs. The problem lies mainly with the absence of clear policies on reasonable accommodation that can be extended to them. This despite national laws that ensure accessible education for all, including UP’s own charter or Republic Act No. 9500. In Asia, the Philippines is a pioneer in disability laws, with the passage of the Magna Carta for PWDs in March 1992. Also known as Republic Act No. 7277, the law even predates the 2006 United Nations Convention on the Rights of PWDs, to which the country is a signatory. The magna carta provides for the rights and privileges of PWDs, including education. Reasonable accommodation, as defined by the law, includes the improvement of existing facilities and provision of auxiliary aid and services to PWDs. Similar to the magna carta, the 2008 UP Charter, which strengthens its role as the national university, emphasizes that it is unlawful for institutions to deny admission on the basis of disability. In the same year the charter was passed, UP exerted efforts in making its admission process more inclusive. The Special UP College Admission Test (Upcat) was formally developed, designed to improve opportunities for PWDs taking the exam. The test extends reasonable accommodation to students with disabilities based on need, such as the provision of Braille test booklets for blind students and sign language interpreters for deaf examinees. Despite differences in administration with the regular Upcat, entrance to the university via the special Upcat is still by merit. Examinees must make it through the cutoff grades set by each campus. Getting qualified in UP, however, is merely the first step. For students like Bautista, now a sophomore studying business administration and accountancy, the restrictive campus environment makes it hard for him and fellow PWDs to experience UP Diliman as any regular student. In the Philippines, facilities for access are stipulated by Batas Pambansa Blg. 344 or the accessibility law. Passed in 1983, it seeks to ensure that public spaces, including educational institutions, are made accessible through structural features, such as ramps and railings. The magna carta refers to this law, emphasizing a “barrier-free environment” with national and local government units providing funds for these structures. However, these features are not all present in many UP Diliman buildings. While most were originally constructed before the law was passed, these were still not modified to be fully compliant with the law after 1983. An accessibility audit of 20 buildings with different functions and high foot traffic, conducted as part of this report, showed that most structures, whether built before or after the law, do not comply with the accessibility law. The buildings lack accessibility features for PWDs, particularly ramps, signages, accessible restrooms and designated parking spots. Ramps with proper dimensions make it easier for PWDs to access buildings. At present, not all have ramps near main entrances. Yet, for most, this is the only accessibility feature. Such is the case at Bulwagang Rizal or Faculty Center, where some professors have their offices. “Sometimes, they use me as the handrail,” said security guard Reginald Alejandrino of elderly professors who have difficulty entering the building. The 42-year-old building has three floors and used to have an elevator. But for decades now, it is just an empty shack. While Benitez Hall, which houses the College of Education, has a ramp by its entrance, its library and special education area are on the third floor. There are no elevators or ramps to aid those with mobility impairment. Other buildings have elevators but are not working, such as the Institute of Mathematics Annex Building. Melchor Hall or the College of Engineering has a working elevator but can only be accessed by faculty and staff members since it uses a biometric system. Accessible restrooms must have specific dimensions and features to aid PWDs. In Diliman, not all buildings have such features. Bartlett Hall or the College of Fine Arts has very narrow male and female cubicles. Restrooms in Palma Hall, which houses the College of Social Sciences and Philosophy, have considerably wider cubicles but still fall short of the minimum dimensions, making it harder for a wheelchair to turn around. Accessible restrooms should have a minimum clear dimension of 1.7 meters by 1.8 meters, with a clear door opening of 0.8 meter. Grab bars are also necessary for persons to hold on to. Some cubicles with extra space, however, are used as storage areas for utilities, such as mops, pails and cleaning liquids. Bautista’s parents accompany their son daily to UP. With the school’s accessibility issues, they have to be with him for his mobility needs. “If his wheelchair cannot fit in the cubicle, we are forced to close the door for the entire restroom, so that no one will enter,” his mother Soledad said. Bautista attended regular schools in Rizal province where they live, but now that he is in UP, they also need his father Gabriel to drive them to and from school, 50 kilometers from home. Some administrative buildings also face accessibility issues. The three-story Office of the University Registrar does not have an elevator or ramp, hindering access to the photo room for identification cards on the second floor. Ironically, the conference room where the special Upcat is conducted is on the third floor. Offices for student services, such as scholarships, loan applications and guidance and counseling, are on the third floor of the six-decade Vinzons Hall. The building has only staircases to access these areas. Most residence halls are more than 50 years old and in the same condition. Kalayaan Residence Hall, which caters only to freshmen, has one entrance, no ramps and no accessible restrooms. Dormitories’ staff also lack awareness and training in dealing with PWD concerns, said Office of Student Housing director Shirley Guevarra. To address these issues, a standard for construction and development must be followed. UP is still in the process of creating its master development plan (MDP), which will build the framework for the development of university lands in the next 10 years. Its development principles and design guidelines state that a “barrier-free design” will be incorporated in compliance with the accessibility law. Not only will the buildings be made accessible but also the sidewalks. Issues in construction and lack of maintenance often present more issues to PWDs than aid. With these issues, the UP administration took a step forward by hiring an accessibility consultant. Architect Armand Eustaquio, a UP graduate, came onboard as the consultant for the Diliman campus in 2014. In March, he was assigned as the consultant for the entire UP system. However, his progress is slowed down by the lack of current building plans that he needs for conducting full accessibility audits of the buildings. a ramp by the entrance, such as in Vinzons Hall, where offices for student services are located. The international symbol of access sign is defaced. Reasonable accommodation should not only be through structural features but should also be present in programs and services for PWDs. The General Appropriation Act (GAA) states that at least 1 percent of the annual budget of a government agency must be allotted to plans, programs and projects concerning PWDs and senior citizens. These should be integrated in the agency’s regular activities. Annual audit reports from 2011 to 2013 of the Commission on Audit (COA) showed that the UP system and its constituent units (CUs) have failed to allocate and implement specific plans and projects for the two sectors. The 2011 report highlighted deficiencies of P2.4 million from the system budget and more than P22 million from the Diliman budget. In response to the 2011 report, the UP administration sent out a memorandum requesting accomplishment reports of CUs on programs for PWDs and senior citizens. The COA report highlighted that verified records show that Diliman really did not formulate any plans and programs pursuant to the GAA. In November 2013, UP president Alfredo Pascual sent a similar request to the CUs. In the letter, he said the Office of the President would be formulating policies and guidelines for PWDs and senior citizens. Diliman responded, highlighting new infrastructure built in compliance with the accessibility law. “To date, we do not provide systemic support services for our PWDs,” wrote Vice Chancellor for Student Affairs Neil Santillan. Diliman has a process of documenting students through the computerized registration system (CRS). Students can disclose their condition when filling out the student profile form, which is answered at the start of the semester. In 2012, around 200 students disclosed having disability, according to Portia Padilla, former head of the Office of the Director of Instruction. This information was used by her office as a rationale for adding a topic on inclusive education in seminars conducted for new and junior faculty members. Beyond that, it is unclear how this information from CRS is being handled. Dr. Therese Bustos of the special education area said that this information was still not disseminated to appropriate units, such as colleges, which can take action, often leaving them unaware of the presence of these students. “I don’t think we have streamlined the system to be able to say, for example, that from the time the student says ‘yes’ (with a disability) in the CRS, that information would be given to all his professors,” said Bustos. She noted that confidentiality was another concern, adding that students might not want professors to know about their condition for fear of getting stigmatized as a burden or as an additional concern in the classroom. Qualified students with disabilities are also entitled to educational assistance under Republic Act No. 9442, which amended the magna carta. Assistance can come in the form of scholarships, and grants and aid, including support for feasible resources and learning materials. For the past academic year, UP employed the Socialized Tuition System (ST System), which determines a tuition discount based on the assessment of a household’s paying capacity. However, the system does not account for medical conditions or disabilities of students, according to the Office of Scholarships and Student Services. UP neither offers in-house scholarships particular to PWDs. Only a scholarship study grant funded by Wheelchair and Disabled Association of the Philippines, a private organization, is offered to all students with disabilities on any campus in the UP system. Despite the lack of policy or designated office, interviews with pertinent officials showed that the same services were extended to all, whether with or without disability. However, there is no coordination and communication between units and departments, as well as appropriate knowledge and training. For instance, the Office of Counseling and Guidance provides assistance on adjustment to university life. However, the office faces difficulties. It has only six counselors serving the Diliman community, and lacks sign language interpreters and materials in Braille. It holds office on the third floor of Vinzons Hall, only accessible via stairs. Moreover, UP does not have any assistive technologies for any type of disabilities, such as screen readers or closed captioning in audiovisual materials. Students with disabilities provide for their own, incurring additional costs. Some teachers also make way to accommodate these students. In the absence of institutional policy and support, accommodations for students with disabilities fall on the community: the faculty and staff.